ALL-NEW HYBRID M5 CLUTCH CONVERSION! 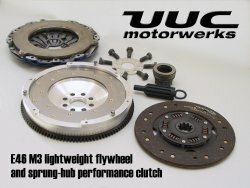 UUC's unique "sprung hub" clutch design Stage2 lightweight flywheel has been named one of European Car magazine's "Top 10 Products" for 2003 in the E36 fitment. Now the same technology is available for the E46 M3. Tipping the scales at only 8.5lbs, this aluminum flywheel boasts the same great features as our first-generation flywheel, but is designed to use the pressure plate, and throw-out bearing from the 3.6 liter E34 M5 and UUC's own sprung-hub clutch disk (available in different materials depending on intended use). Big news for E46 M3 owners! Many E46 M3 owners have experienced mushy clutch feel, inconsistent engagement, and premature wear of the clutch in their manual-transmission cars. The reason is quite simple - the original BMW (LUK-manufactured) clutch in the E46 M3 has a new "SAC" (Self Adjusting Clutch) design. This new mechanism built into the clutch pressure plate is supposed to keep the clutch pedal engagement point the same as the clutch wears... but in all reality, it's a case of "an answer to a question that nobody was asking." They have added a layer of complexity and feedback isolation, filling a need that didn't need filling - it is not too often that anybody notices that their clutch engagement point as moved 1/2" over 50K miles. The M5 component conversion eliminates the SAC mechanism and restores traditional clutch feel with predictable and crisp engagement. The advantage of a sprung-hub clutch design is improved resistance (and in many cases, complete elimination) of the residual rattling noise at idle that some lightweight flywheel-equipped cars can experience. Because BMW spec'd this clutch design for use on the powerful S38-series engine in the M5, it is up to the task of handling the output from the M3's S54 motor. The total weight of this clutch disk and pressure plate combo is greater than that of a standard E46 clutch, so we have reduced the flywheel weight to achieve an overall rotating mass that is almost identical to a standard 11.5lb lightweight flywheel and 3-series clutch combination. 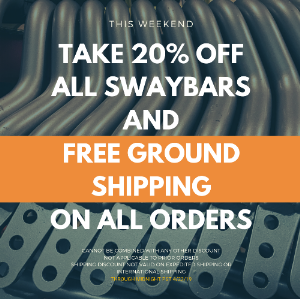 You can be assured not only of the performance increase you will experience, but the long-term ease of ownership that comes with knowing that replacement clutch components are never any further away than your dealer's parts counter. Ideal clutch combination is the E34 M5 pressure plate and UUC sprung-hub clutch disk, although standard fixed-hub E46 M3 clutch disk (emergency repair) may be substituted - increased gear rattle will result. Not sure which clutch? CLICK HERE for clutch material selection guide. From Connor of Calgary, Alberta on 7/14/2014 .